The American Housing Survey data from the US Census has a table on the mortgage characteristics for households in the USA. I pulled out the data for the years 1993 to 2007 to find out how many homes are owned free of mortgage and how many fixed or adjustable rate mortgages (ARMs) there were. The charts below show the data. 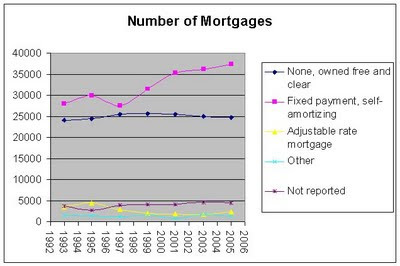 First lets look at the total number of homes with no mortgage, fixed, ARM, other or 'not reported'. I throw in the not reported # because its fairly large #. Note that I'm only looking at the primary mortgage. There are some other homes with home equity lines or loans. As you can see from the chart the chart that the vast majority of homes are either owned free of a mortgage or have a fixed rate mortgage. The sum of all the above numbers grew by about 17% from 1993 to 2007 which is the same rate at which the US population grew. You can see from this that over 80% of homes are owned outright or have a fixed mortgage. 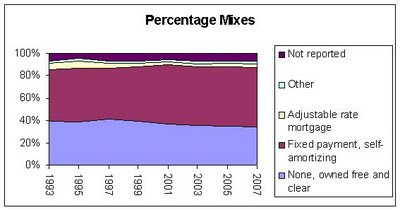 In 2007 only 3% of the total was ARMs. Back in 1995 the ARMs were 7%. I would guess that the amount of ARMs would go up and down as a reflection of interest rates at the time. If interest rates are relatively low then people are more likely to go for a fixed rate to lock in favorable terms for a longer period.